You love the environment. We love the environment. You love craft beer. We love craft beer. Look at all those shared passions! We're tying those two together with a March fundraiser for High Country Conservation Center (HC3), one of our favorite nonprofit organizations in Summit County, with a focus on promoting practical solutions for waste reduction and resource conservation in Summit County. For the entire month of March, we're donating kegs to Apres Handcrafted Libations for a designated March Giving Tap, where 10 percent of proceeds from every beer poured on that tap will be donated to HC3. All month, you'll find a variety of our beers on tap at Apres, including fan favorites like our IPA, Ginger Pale Ale and Coconut Porter. 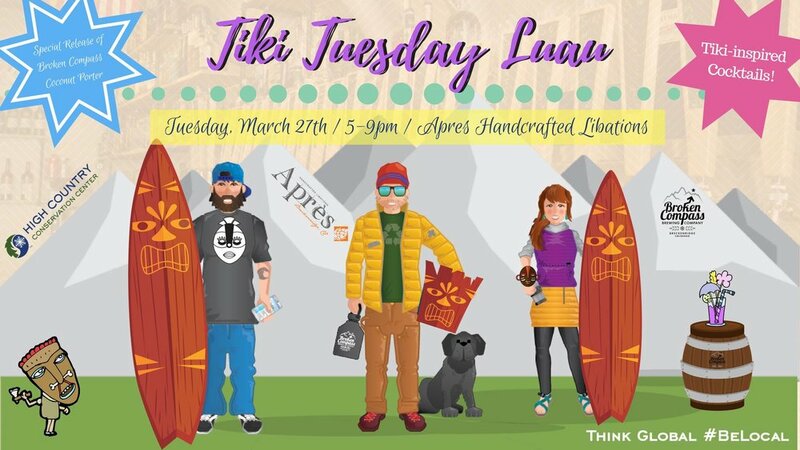 To finish off the month of fundraising, Apres is hosting a Tiki Tuesday Luau on March 27th from 5-9 PM. Dust off your island attire and join us for a night of tiki inspired cocktails and a rare outside our taproom tapping of our Coconut Porter. Ten percent of Broken Compass and cocktail sales fro the evening will be donated to HC3.